Valentine's Day can be celebrated in many ways, one of which is to present a gift to that special person in your life. What better gift to hand over than stunning jewellery? We selected a gorgeous range of jewellery that fits the spirit of Valentine's Day! Find Sterling Silver Jewellery are of the finest quality. Of course, they are all hallmarked so you don't need to worry about anything since it's all genuine! The earrings measure 16 x 15mm in size and have a weight of ca. 2.7g. All earrings from our Clare Hawley range carry the Hallmark from the Edinburgh Assay Office to guarantee the minimum 92.5% Silver content that is required for Sterling Silver. The earrings are delivered in a lovely jewellery gift box. The pendant measures 15 x 15mm in size and has a weight of approximately 2.9g (inclusive chain). All pendant necklaces from our Clare Hawley Collection are hallmarked by the Assay Office Edinburgh, to guarantee the minimum 92.5% silver content, that is required for Sterling Silver. The chain is included and the pendant necklace is delivered in a gorgeous gift box. 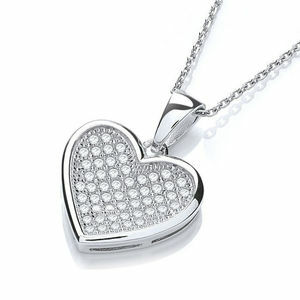 This piece is a solid heart, set with cubic zirconia stones. 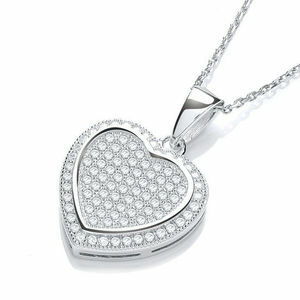 In the centre of it an outline of a heart frames the cubic zirconias, putting both metal and stone on display. With a mix of the finest cubic zirconia and genuine, hallmarked Sterling Silver, this is a great choice if you want to impress! A solid, yellow gold heart. 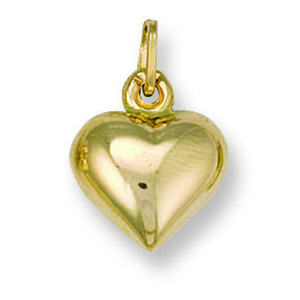 What better way to show your loved one a heart of gold? Made of 9 carat yellow gold, this pendant is a great choice if you want to gift your partner something small, yet appropriately luxurious. While this piece is below the required weight for a hallmark, we assure you it is just as genuine as the rest of our Valentine's Day range! 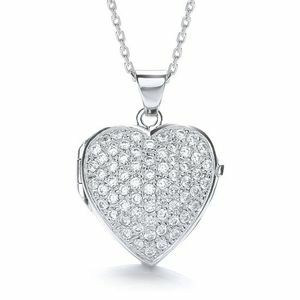 This dazzling sterling silver heart is a great display of the cubic zirconia pavé. The pendant is worn with an 18 inch chain. With a hallmark from the UK guaranteeing it to be genuine 925 Silver, your choice is sure to be a quality one! 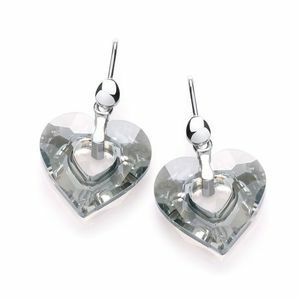 These Swarovski Crystal heart shaped earrings are definitely an eye-catcher. The piercing is made of quality Sterling Silver, hallmarked in the UK for your peace of mind. Also available as a pendant in two different sizes! Two hearts, one holding another. Yellow gold on the outside, white gold on the inside. With a cubic zirconia stone in the centre, this pendant offers a mix of beautiful metalwork and a simple, yet attractive design. Take a look for yourself! 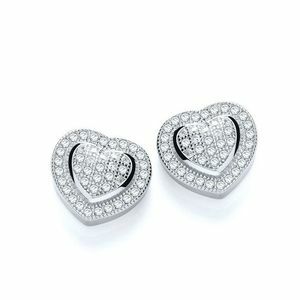 Stylish and compact, these Heart studs can help you make the right impression. Made of 9 carat White Gold, they are inset with the finest cubic zirconia. If you'd like to gift your partner a set of earrings that's small on size, but big on style, this set is the one to buy! Stud earrings made of Sterling Silver. With a micro pavé setting as the centerpiece of the design, they are a great choice to add a little spark to your style. The metal used is Sterling Silver, hallmarked by the Edinburgh Assay Office, so high quality and genuineness is guaranteed! 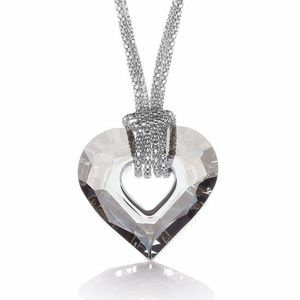 This piece is a Swarovski Crystal, shaped into a heart. Worn with a stylish 17 inch sterling silver chain, you can count on making a good impression. Feel free to take a closer look at the Crystal! A UK Hallmark certifies the quality of the chain's Sterling Silver. A pendant of Sterling Silver, in the shape of a heart. With a smaller heart outline on the inside, it helps accentuate the outer layer of cubic zirconia stones. The pavé setting on this piece is a fitting addition to the brilliant shine of the 925 Silver. Hallmarked in the UK, you are guaranteed the highest quality silver! 9 carat yellow gold, and a stylish Filigree patterned heart. This combination can only lead to an enchanting set of drop earrings! With a dangling chain, their design is dynamic and definitely a head turner! 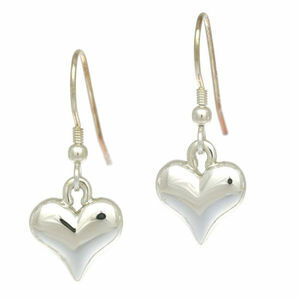 The classic and cute design, hearts, in a gorgeous design, made from Sterling Silver. The earrings are handmade and carry a hallmark from the Edinburgh Assay Office to attest the minimum silver content. Made of Sterling Silver, set with cubic zirconia. 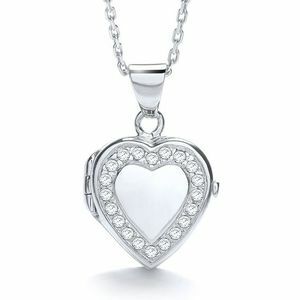 The front of the locket displays another heart, with a brilliant silver sheen. 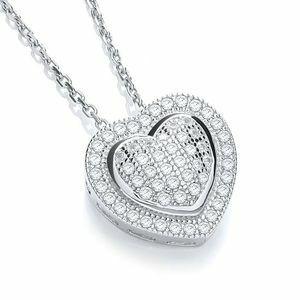 The inner heart is framed with cubic zirconia stones, accentuating the shape of the piece. The chain can be worn as either 16 inch or 18 inch, and is made of genuine Sterling Silver. Hallmarked in the UK. 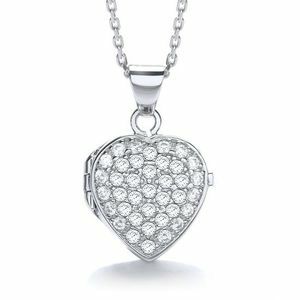 On this locket, a setting of cubic zirconia adds to the sparkling look. The chain on this piece is a Sterling Silver, Rhodium-plated item that can be worn as either 16 inch or 18 inch. The UK Hallmark placed on this piece guarantees that the 925 Silver is genuine! This piece is a marvellous arrangement of cubic zirconia. 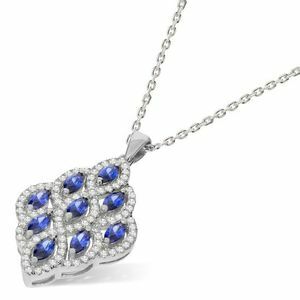 With a multitude of white cubic zirconia stones framing the 9 large blue cubic zirconias, this luxurious pendant will not go unnoticed. An 18 inch Sterling Silver chain ensures an easy fit, and the piece is hallmarked in the UK - genuine 925 Silver! 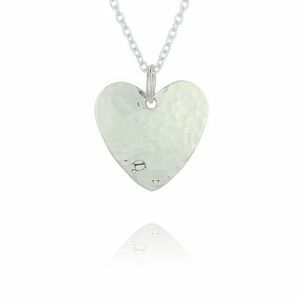 This large sterling silver heart is an excellent way to show your appreciation. The design makes for a great sight with the Silver's reflective surface. Worn with an 18 inch chain, also made of Sterling Silver. Hallmarked in the UK by the Edinburgh Assay Office, so rest easy knowing it is a quality choice! 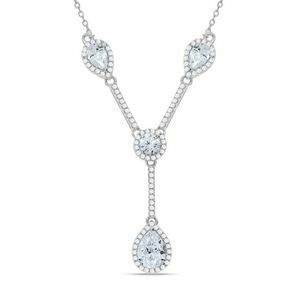 This Sterling Silver necklace is adorned with 4 cubic zirconia stones - three teardrops with a round stone in the middle. They make for quite the statement, and with an 18 inch chain you can be sure it will be a good fit. The piece bears a UK hallmark, so you don't need to worry about the genuineness of the metal. These stud earrings are made of the finest 9 carat gold. With a full shape, they are sure to attract attention with the rows of dazzling cubic zirconia stones accentuated by the brilliant sheen of White Gold. Take a look! This solid heart has a full, rounded shape to it. Paved with countless cubic zirconia stones, it can definitely garner attention. An 18 inch chain is included, and both pieces are made of Sterling Silver. UK Hallmarked, genuine 925 Silver. Would you like to make a bigger statement? We can help you. 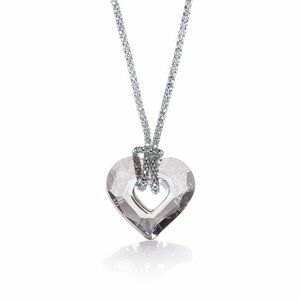 This Swarovski Crystal heart makes for quite the eye-catching piece. The 17 inch chain, made of Sterling Silver, ensures it will be a good fit and is hallmarked in the UK so you know it is a genuine article. Take a look for yourself! White Gold? Yellow Gold? How about both? 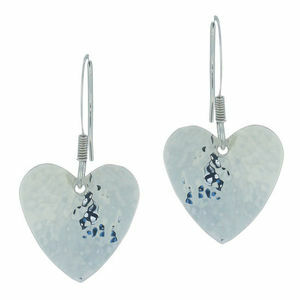 These paired heart earrings will help you show that you make a great pair with your loved one! Made of genuine 9 carat gold, and hallmarked for your peace of mind! Like to make a bolder statement? Or maybe you'd just like to fit a bigger photo of your loved one to wear around your neck? We've got a locket just for you. Set with Cubic Zirconia, this Sterling Silver piece is a brilliant way to store a fond photograph! The chain is also made of Sterling Silver, and Rhodium-plated for improved tarnish resistance. Hallmarked by the Edinburgh Assay Office, guaranteeing the best 925 Silver! Adorned with Swarovski Elements, this bracelet is a great way to show your loved one that you appreciate them. 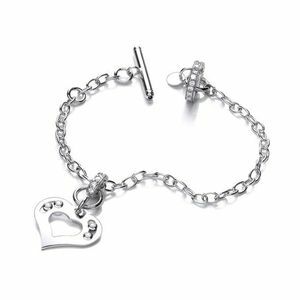 With a heart shaped design adorning the bracelet, this Sterling Silver piece might just be what you need to add a finishing touch to your style! Hallmarked in the UK, made exclusively of genuine 925 Silver. What better way to store a picture than a locket? 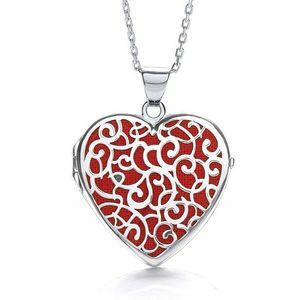 This heart-shaped locket offers an attractive, floral pattern set against a red background. 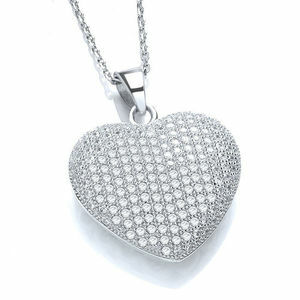 With a rhodium-plated, tarnish resistant chain, you can wear your loved one's picture around your neck anytime you want! The Locket is made of Sterling Silver and so is the chain. It can be worn as a 16 inch or an 18 inch long chain for a comfortable fit. 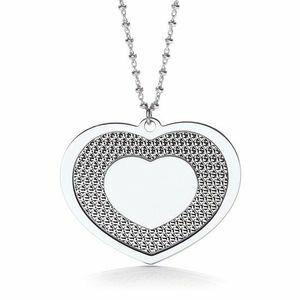 This glamorous locket lets you keep your significant other's picture in an appropriately luxurious style: A Yellow Gold heart, outlined by a swirling White Gold pattern framing a smaller yellow gold in the middle. With a mixture of colours complimenting each other, and a stylish exterior, this is a great home for a fond photograph! These exquisite earrings are one way to show your loved one that they are the most important one in your heart. Made of 9 carat White Gold, and adorned with a 0.50 carat Diamond gemstone setting. The enchanting nature of these diamonds lining the heart outline is accentuated by the white gold metal - a perfect suit for gemstones which shine brightly. If you need more inspirations or look for something more than just heart designs, you can explore the full sections that may interest you. In case you want to REALLY impress your loved one and want real, solid gold or even diamonds, then you have to visit our partner site JAREEYA. Valentine's Day, usually celebrated on the 14th of February, was first connected to love in the 14th century. However, it's only in the 18th century that it became known as the day in which you express love towards your partner through gifts or greeting cards also called 'valentines'. Also, it originated in England! It was only later on, in the 19th century, that it began to spread all over the world. Most countries either adopted the existing customs (like Philippines), or adapted the holiday to their own culture (for example Japan). It's popular enough that it's celebrated around the world, in many countries across different cultures! Often, people give each other sweet gifts such as chocolate, but sometimes creativity can result in quite extravagant gifts! Of course, expensive gifts are not the only way. With our choice of jewellery, you can choose something that not only looks great but also is affordable.